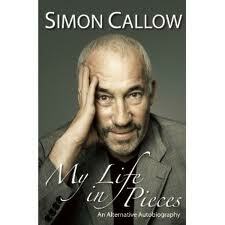 The best new theatre book to come my way was Simon Callow’s “My Life in Pieces”. The whole book flows over with enthusiasm for everything in theatre, with one exception- (see end). Its first virtue is that reports from the inside on acting are relatively few in number. Timothy West and Harriet Walter have both written good things. Michael Simkins’ “What’s My Motivation” should be mandatory reading for drama students for its mix of passion, comedy and sheer career happenstance. Simon Callow is about an eloquent as can be on an art that is about as elusive as can be. In structure his book is unusual, if not unique, in linking a biographical text to the occasional writing- reviews, obituaries, articles- that he has done over decades. In reviewing a biography of Lee Strasberg he pins down the Method in a way which I might have suspected but would never have been quite able to articulate. Historically, the book occupies a fascinating time span with its first-hand reports of a generation of departed greats. The great knightly Autumn performances from plays like “Home”, “No Man’s Land” and “the Old Country” are all there. But there is a stain in this effervescent world. “Critics. Even as I write the word, a sort of hopelessness spreads over me, an inner voice whispers: "You can't win this one." At the beginning of one's career (and in some cases, at the beginning, in the middle and at the end), one is so shocked by the whole phenomenon of criticism as it is practiced - the cavalier judgements, the slipshod reporting, the personal animus, the power of life and death over a show or an exhibition or a career - that one's instinct is to fight back, to have a show-down, to scotch the lie. …When the critic of a Sunday paper devoted a whole paragraph of his vitriolic review of my production of My Fair Lady to my arrogance and lack of psychological insight by re-arranging the order of numbers in the score, I wrote a mild letter pointing out that the sequence was the standard sequence. The critic in question wrote one sentence by way of reply: "I could have cried all night."